Apparently the average rainfall in Chile is greater than the UK. Not much consolation for those at home and struggling with the rain, cold and flooding. We can believe this fact as it is an overcast start to the day which turns to rain by the time we leave the hotel. 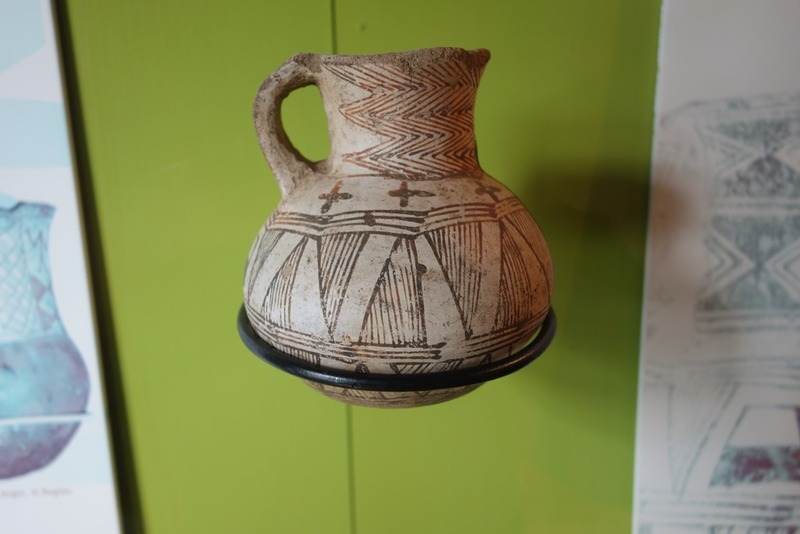 Today we had already decided was a trip to the Museo Historico y Arqueologico to learn more about the area and history. 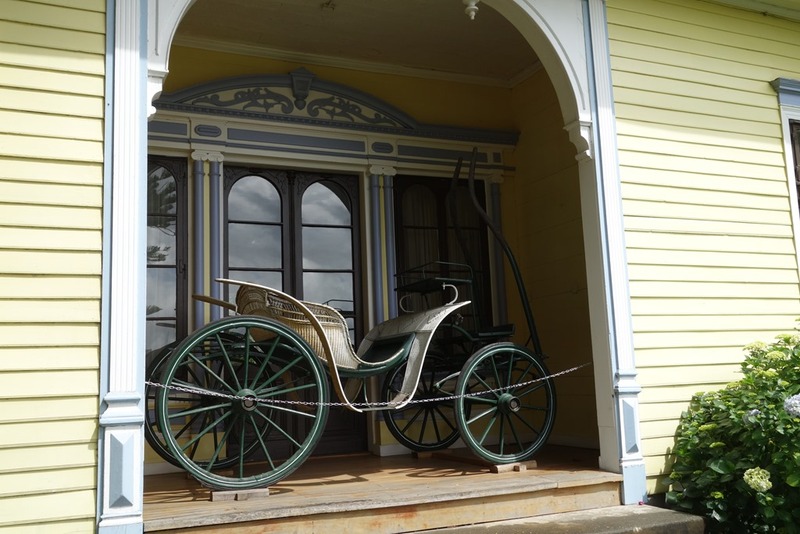 The museum is across the river occupying a riverfront mansion, with views back at the fish market and town, although we do not stop to look as we are keen to get out of the rain. The downstairs rooms have been laid out with furniture through the ages and each room dedicated to the various people who shaped the history of the town. It is interesting to see the signs in Spanish, German and English showing the German influence in the area. The first room is dedicated to Lord Thomas Alexander Cochrane, a Brit who was hired by the Chileans to overthrow the Spaniards in 1820 and gain the Independence of Valdivia, two years after Chile gained its Independence. 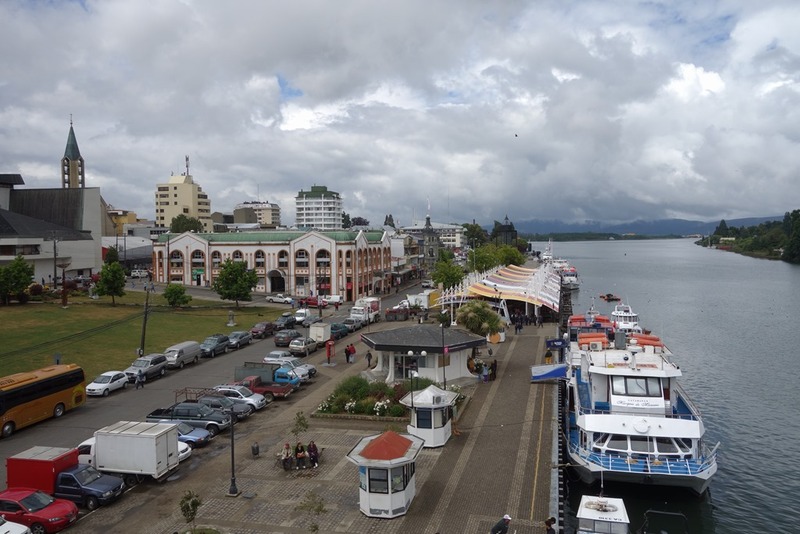 The Germans did not settle until 1850 and helped Valdivia to prosper. There are references to Anwedter and Kunstmann who we heard about yesterday and their brewing. The first floor was devoted to older history with fragments of pottery and fabrics. It was interesting to compare them with other examples we have seen in South America. 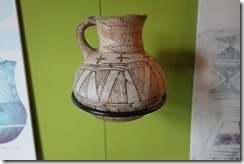 The pottery has similar marking to that seen in Lima, Peru but the shapes are completely different. 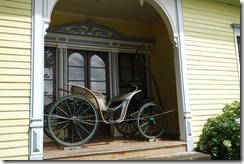 The textiles are thicker, presumably due to the colder climate and the designs are much less ornate. 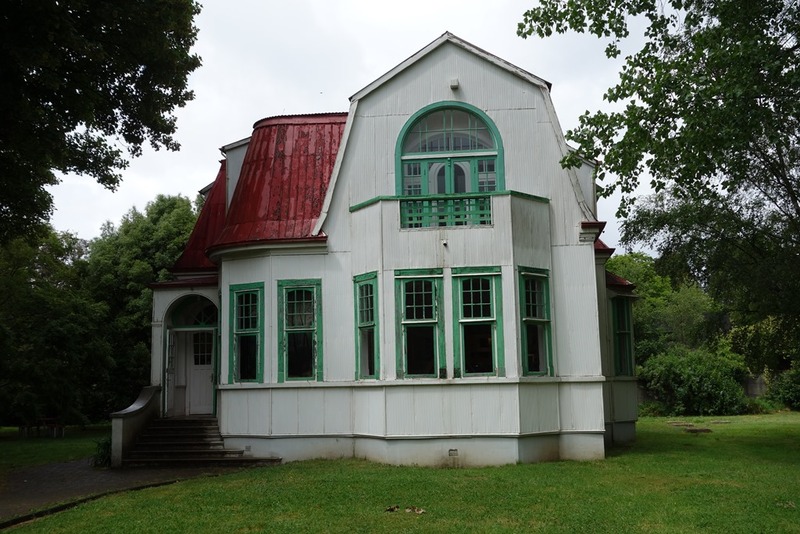 Included in our entrance fee was a separate museum in a 1914 Mansion behind the Historical museum, dedicated to R A Philippi who along with Darwin and others was involved in identifying and cataloguing the wildlife. He was also responsible for the country’s scientific and cultural development and wrote “Journey to Atacama Desert” (shall I get this to add to Sheila’s reading list?? Probably not!). Luckily by this time the rain had stopped so we could leave our cultural development behind and head off to find lunch. 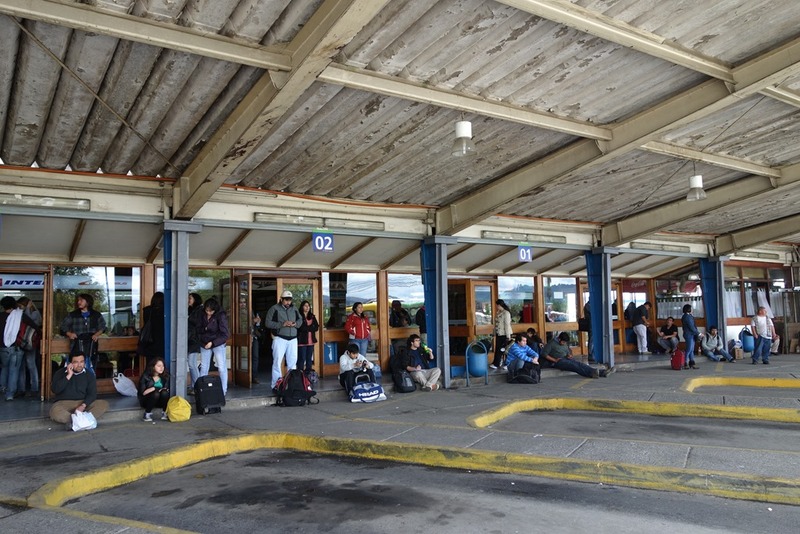 We are due at the bus station at 1:40 for our bus to Pucon so head off to collect our backpacks. Now the sun is shining and the sky blue but we can only admire it through the bus window. The scenery is very much like the UK with green fields and forests of much taller trees than in Patagonia. 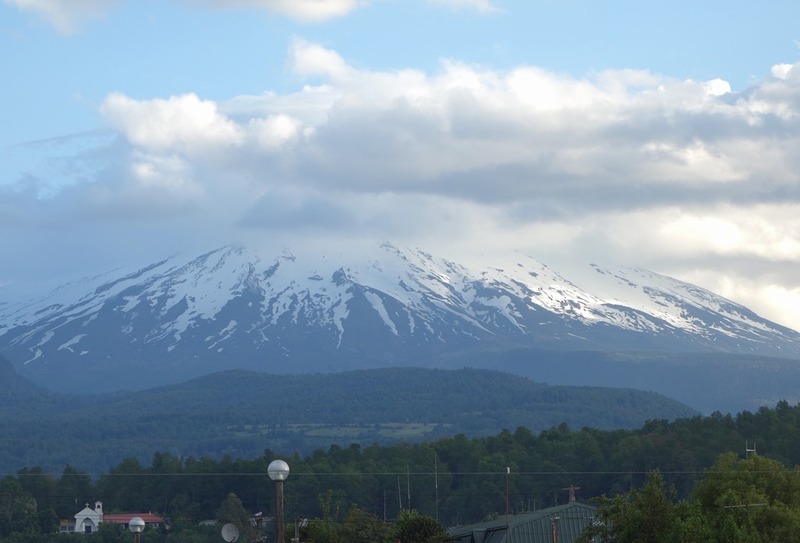 On approaching Lago Villarrica there are glimpses of the stunning views over the water to Volcan Villarrica, close to Pucon where we are staying for the next two nights. 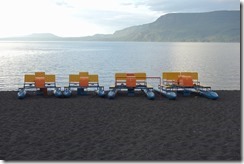 Pucon is at the far end of Lago Villarrica and a popular place with the Chileans as well as tourists coming hoping to climb the volcano. After reading Andy and Sarah’s blog of their climb with ice axes and “tea trays” to slide back down using the ice axe as a brake, I think I am relieved that the weather forecast is not good so we are unlikely to have to make the decision to climb or not. The summit is currently in cloud and likely to stay that way for a while. The main street (O’Higgins again!) 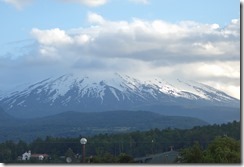 is a mix of restaurants and tour offices advertising the volcano climb, rafting, skiing, cycling and hiking. Like El Calafate but bigger. We have paid an extra $5 a night for a superior room at our hotel and it is the most luxurious we have had in a while, but still far from 5*. Also it is right at the far end of the building so very quiet, especially as the hotel is far from capacity. 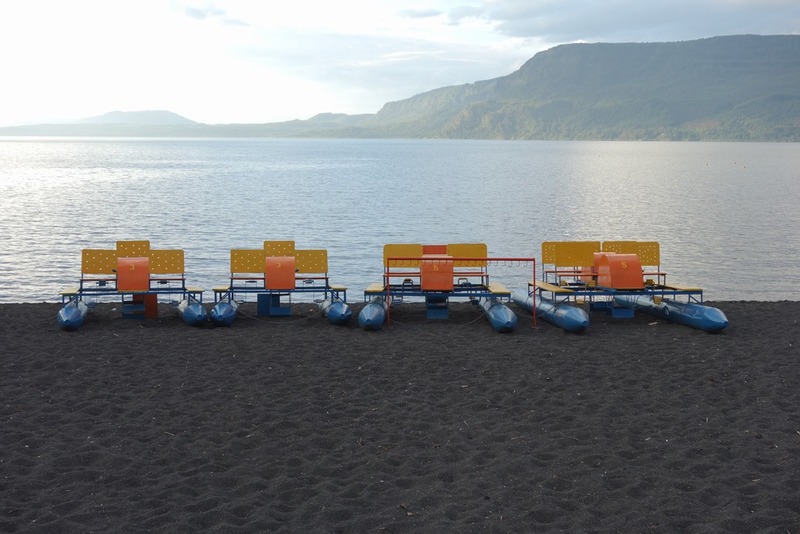 We take a stroll down to the lake and the Playa Grande, a beach with grey volcanic sand, in case it is our only chance to photograph it with blue sky! Tonight we tuck into pizza with happy hour for the cocktails and wine. Well the cycling tomorrow will blow away the cobwebs! 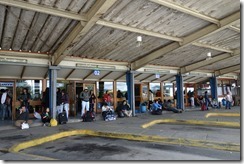 This entry was posted in Chile, RTW Trip and tagged Chile, Pucon, Valdivia. Bookmark the permalink.